When I say "cup" I mean a UK mug-sized vessel, not the US measurement! Wash the rice, either in the pan or in a fine sieve, under hot water, until the water runs (almost) clear. Add the water to the rice and boil for ten minutes, until the rice is soft and edible. Rince the rice again in a sieve, this time with cold water. Beat the egg. Add half of it to the centre of a seasoned wok, and let it curdle slightly. Using a fork cut the cooking egg, so it cooks in pieces, somewhere between bits of omelette and scrambled egg. 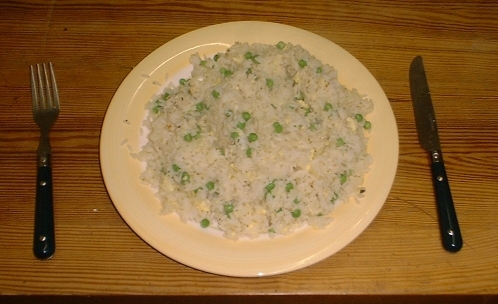 Once the egg is cooked and in pieces, add all of the rice, and stir well so they mix. Wait a few moments for all of the rice to warm up, continuing to stir as necessary. Make a well in the centre, and add the rest of the egg. Wait while the bottom of the pool of egg cooks solid, then stir so that it breaks into pieces, and mixes with the uncooked egg. Gradually stir in some rice from the edge of the well (as if mixing water with icing sugar, maybe?) and keep mixing - when almost all the egg is bound to rice or more egg, mix thoroughly so that the mix contains rice, rice covered in egg, and pieces of egg. Stir well and turn up the heat for a few minutes. Now that everything is sizzling nicely, add the frozen peas and the finely chopped onion. You can blanche either of these ingredients if preferred, but it isn't required. 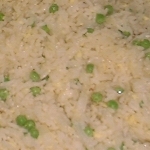 Stir frequently until the peas and onion are well mixed and as hot as the rice. Remove from heat and serve at once.